Welcome to the latest edition of Friday Foodie! Today, I am featuring Kate Willbourn-Trevett, who is the founder of the food and lifestyle blog Foodies Agenda and the brand new Australian food discovery business Foodies Collective. I hope you enjoy today’s Friday Foodie! My name is Kate Willbourn-Trevett, a born & raised Sydneysider foodie, home cook and founder of Foodies Collective. I’m also a new mum to a beautiful baby girl and wife to an English gent, the loves of my life. Really understanding how your own body works is the key. I don’t believe one diet fits all. What works for you today may be different tomorrow too. Keeping a healthy balance of wholesome eating & exercise, with the occasional splurge (like a chocolate brownie kind of splurge) works for me. What inspires me to keep in good health is my own personal state of happiness and my family. What inspired you to start Foodies Collective? In 2013 I started the blog foodies agenda with a vision to inspire, educate and have fun with food. Over time the blog fine tuned its focus on Australian food and its foodie superstars – the chefs, stylists, photographers, bloggers, farmers, producers who all make our local food industry as exciting and dynamic as it today. Feedback from readers was overwhelming. It was clear foodies within Australia wanted to learn more about our local food scene and where their food comes from. This led to a light bulb moment which is Foodies Collective. A new home for Australian foodies where you can discover & actually taste the best Australian artisan food from all corners of the country. Foodies Collective recently launched with its first product – The Discovery Box. Foodies within Australia will have the opportunity to have a Discovery Box delivered to their door-step bi-monthly, introducing them to 6-8 premium artisan products each time to either eat straight away or cook with. Included within each box is a beautifully crafted minizine featuring interviews with the producers, tips and tricks, recipes and suggested pairings to ensure you get the most out of the box. I’m so excited to deliver an experience which reaches our community beyond the interwebs! Write a weekly shopping list and eating plan. I find if you stock your pantry and fridge with healthy, wholesome food, and have a bit of a guide to follow, the less you’ll be tempted or swayed. When I need to watch our budget, I pull back on the quantity, (never quality), of meat. Meat tends to be the most costly on a shopping list, so just pulling back a little will help save a few dollars. Take up a weekly challenge like #meatfreemondays or simply reduce the individual portion size of meat. Not only can it be better for your health, but the environment. Another golden rule to follow is to buy fresh produce in season. Not only will it be cheaper, it will be more nutrient rich and best of all, flavoursome! Stir fry’s are not only super fast to make, but healthy too. My go to is chicken mince with crisp green veggies, noodles, garlic, oyster sauce and a final sprinkling of sesame oil. The options are endless, let your imagination go wild! Another great quick meal is an omelette with a fresh leafy salad. Homemade Granola is something I make most weeks. There is always a jar of this in our pantry. There is nothing better than the waft of this freshly baked granola in the house. I hope you love it as much as we do. In a small saucepan, gently heat the oil, maple syrup, cinnamon & vanilla. Swirl the pan to encourage the ingredients to combine. Remove from the stovetop. In a separate large mixing bowl, mix together the oats, puffed rice, seeds & nuts. Add the warm syrup, stirring until everything has a shiny coat. Line a large rectangle baking tray with baking paper. Pour in the oat mixture and spread out evenly using a spoon. Place in the oven for 15 mins . Remove from the oven and give the mixture a stir. Return to the oven for a further 10mins. Remove from oven one last time, add the coconut, sultanas and drizzle over the honey, giving it a quick toss before returning to the oven for a further 3 mins. Turn off the temperature & allow the granola to cool in oven. Store in an airtight container. A little more about Kate and where you can find her. 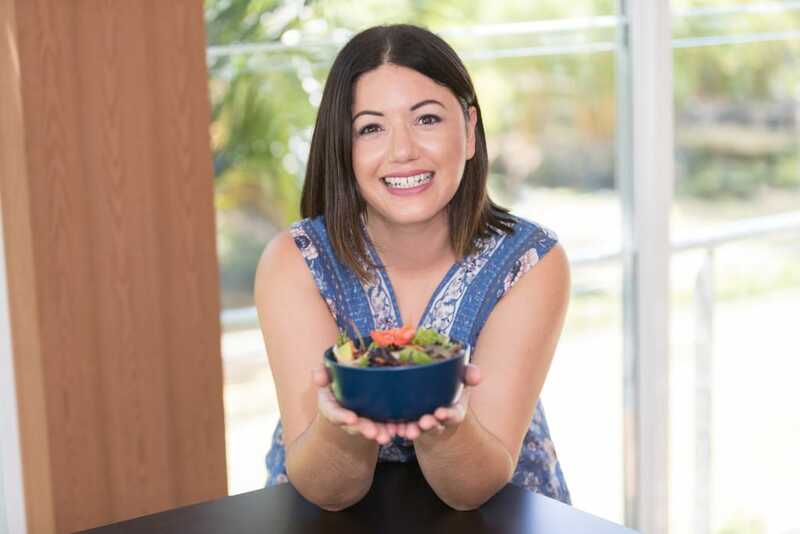 Kate is the founder of the REAL food and lifestyle blog Foodies Agenda and the brand new Australian food discovery business Foodies Collective. Amongst her creative and professional pursuits, Kate is also an official Australian ambassador for Jamie Oliver’s Food Revolution.The role of an ambassador is to encourage and inspire positive change in the way we access, consume and understand real food. Not only is Kate passionate about surrounding herself, friends and family with positive and delicious food experiences, her mission with Foodies Collective is to help passionate foodies discover and taste the best Australian made food and by doing so, support our local producers and makers.